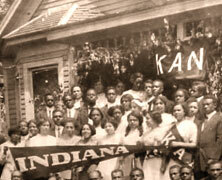 1911 – Kappa Alpha Psi Fraternity founded. Kappa Alpha Psi (ΚΑΨ), a predominantly Black college fraternity was founded on this date. at Indiana University Bloomington. Kappa Alpha Psi Fraternity, Inc. was founded by Elder W. Diggs, Byron K. Armstrong, John M. Lee, Harvey T. Asher, Marcus P. Blakemore, Guy L. Grant, Paul Caine, George Edmonds, Ezera D. Alexander and Edward G. Irvin. The fraternity was founded as Kappa Alpha Nu. The fraternity opened a second chapter at the university of Illinois in 1913 and then expanded to Black and white schools throughout the country. The name Kappa Alpha Nu was conceived in tribute to an earlier fraternity, Alpha Kappa Nu. Unfortunately, then name was used derogatorily by racist student. Founder Elder Diggs was watching an initiate compete in a track meet when he heard slurs from the stands directed at the athlete, calling out “Kappa Alpha Nig.” The fraternity subsequently changed the name to Kappa Alpha Psi on April 15, 1915. The fraternity is known for its use of canes in step shows. The cane sport the fraternity colors and was recognized as an important part of the fraternity’s culture in 1985. The fraternity engages in several national campaigns to promote education and occupational guidance for youths. 1943 – William H. Hastie Resigns Position as Aide to Secretary of War. Hastie, a graduate of Amherst College and Harvard Law School, served as a Professor at Howard University Law School where he taught Thurgood Marshall. He later served as assistant solicitor for the Department of the Interior was the first Black Federal Judge, appointed by President Franklin Roosevelt to the United States District Court for the Virgin Islands. He resigned his position as a judge to become the Dean of Howard Law School in 1939 and during World War II was asked to work as a civilian aide to the Secretary of War, Henry Stimson. In 1943, however, Hastie resigned from that position to protest the Army Air Force’s policy of racially segregating its training facilities as well as insufficient training for Black pilots and the inequality of assignments between white and Black servicemen. He was honored by the NAACP, receiving the Spingarn Medal in part because of his protest. Although many believed this would end his career in the Federal government, Hastie was subsequently appointed the territorial Governor of the U.S. Virgin Islands in 1946 by President Harry Truman. He served in the position for three years, whereupon Truman appointed him to the U.S. Court of Appeals for the Third Circuit. In both of these positions, he was the first Black to serve in such a capacity. He would serve on the Court of Appeals for 22 years, named the Chief Judge of the Third Circuit in 1971. He died in 1976. 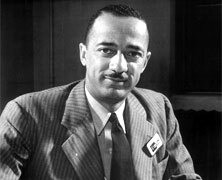 For more information about William Hastie, visit his biography at the Great Black Heroes website.